Clara, aged 22, started piano lessons with Lynne Fenech MA (Sheff) BAMus (Hons) DipMus CTABRSM FISM at the age of 9, gaining distinctions in Grades 1-8 with The Associated Board of the Royal Schools of Music (ABRSM) and Trinity College London (TCL). In 2015 she attained a high distinction in the Associate Diploma in Music Performance (ATCL Recital) with TCL. Clara has been awarded the prestigious Board Prizes by ABRSM and TCL for achieving the highest marks in Malta, and performed at the High Scorer’s/Distinction Concerts for both Boards. She has also performed at various concerts in esteemed venues such as Villa Bologna in Attard, the President of the Republic of Malta’s Palace in San Anton and for the Association of International Women in Malta (AIW Malta). 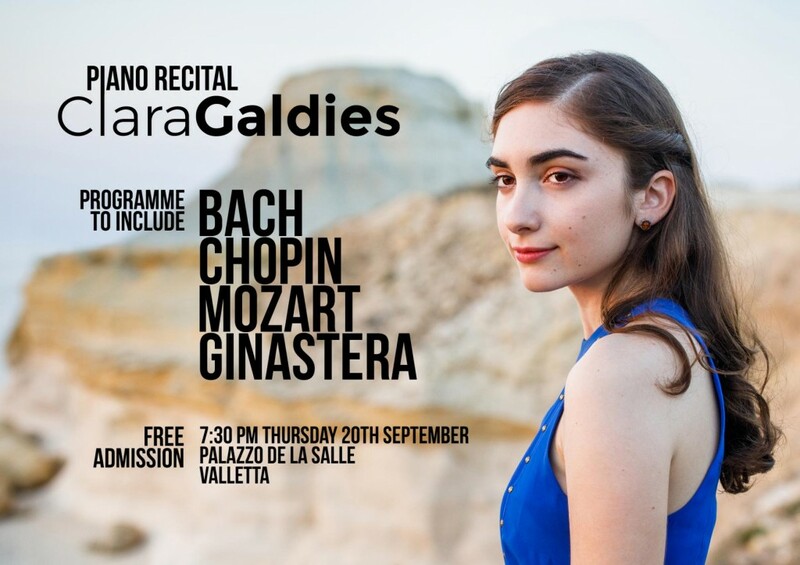 Presently in her final year at the University of Malta reading Law, Clara will be shortly sitting for her Licentiate Diploma in Music Performance (LTCL Recital).